June 28th, 2013 | Moving Tips. Often times, moving brokers are described as the middlemen between the customer and the moving company. The theory behind a broker is that you as the customer could have access to several competitive moving quotes through one single source: the broker. While there are of course many moving brokers who run legitimate businesses accredited by the Better Business Bureau, there are also less reputable brokers who have unfortunately left customers in not-so-good situations. It’s worth the time to read through this report by the U.S Senate Committee on Commerce, Science and Transportation that highlights customer protection problems posed by illegitimate moving brokers. One of the more frustrating parts of working with a moving broker is that a broker isn’t responsible for what happens once a moving company is selected. A broker takes the fee (usually paid by the moving company to the broker for a sales lead opportunity) and then brokers are void of responsibility. You might not even know who your moving company will be until they arrive at your home on moving day. That means you won’t have the opportunity to do any research on them until moving day arrives. If things go wrong during the transport of your belongings, whether big or small, the broker has no accountability and you run the risk of the moving company not being uninsured. Moving Broker: Moving brokers don’t own trucks or employ movers. They are not accountable for your moving experience. 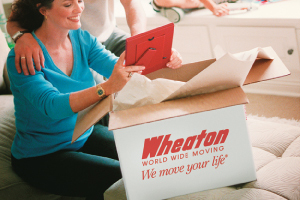 Moving Carrier: A moving carrier, such as Wheaton World Wide Moving agents, own their own trucks and warehouses – they’re not just a name and phone number floating around on the Internet. A carrier employs part- and full-time staff who are highly trained in the moving industry. A carrier also often depends on references and repeat customers for business and because of that, strive for great customer service. A moving carrier is also licensed, insured and accredited by major business, transportation and regulatory organizations. Lastly, a moving carrier is fully responsible for lost or damaged goods and therefore work diligently to prevent mistakes, but are always prepared to address these situations when they come up. A reputable moving carrier should always explain their claims policy on their website, just like Wheaton does. As one of the oldest and most revered moving companies in the country, Wheaton World Wide Moving has a long and respected reputation. All of our agents have offices, facilities, and warehouses and also own their own trucks. All Wheaton agents have accreditation, insurance and licenses and always aim to provide customers with the best experience possible. I have decided to go with Wheaton instead of the other two big movers. One reason for my decision was that the estimate was easy to read and included all advertised specials. Hello Frank, thank you for making Wheaton World Wide Moving your preferred mover of choice. We are looking forward to moving your life. If you have any questions or concerns, please call 1-800-932-7799.